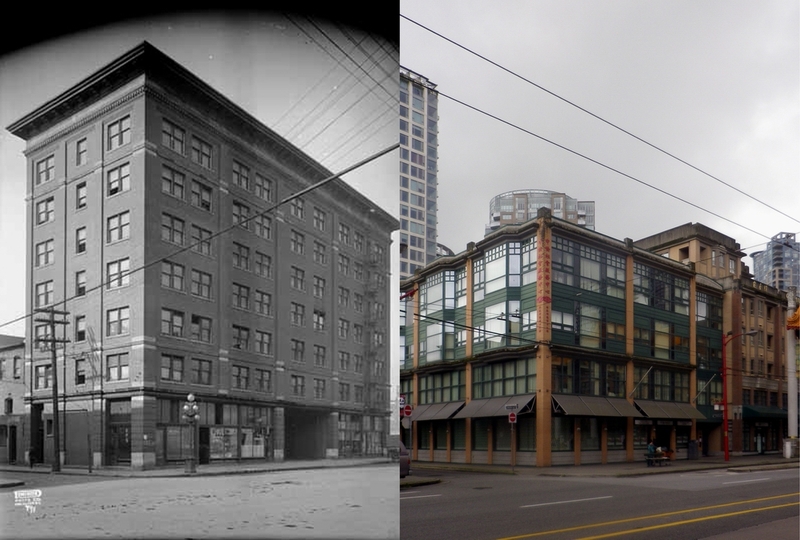 This location started life in Chinatown as 23 Dupont Street, but by the time these buildings were built the street had been renamed (in 1907) as East Pender. There was a buildings here in 1889, but the existing 4-storey Ming Wo building was built at (or just before) 1913. It was built for Wong Soon King who headed a company that bore his name, but who also controlled opium processor and dealer Hip Tuck Lung. That company operated from the other side of the street at 4 East Pender, but in 1908 they moved to 23 East Pender. Hip Tuck Lung were one of the bigger opium companies; in 1908 the local newspapers reported that William Lyon MacKenzie King was shocked to discover they made a profit of $180,000 in the previous year. (Paul Yee in Saltwater City says their gross income was reported to be $170,000). MacKenzie King was in town to settle claims for damages after 1907 anti-occidental riots, but returned to Ottawa determined to close down what he was surprised to find was a completely legal business. Hip Tuck Lung, in 1908, were said to have been in business for 22 years (which would put the business founding close to the creation of the city in 1886). They show up as importers of opium in the 1889 street directory. The earlier building shows up in the 1891 street directory, occupied by Miss Della Montague, one of a number of ladies whose business was concentrated for a while on Dupont Street. In 1900 Wong Sing King was one of the founding members (and recording secretary) of the Chinese Empire Reform Association, a charitable body whose intent, in part, was to be achieved “by promoting and encouraging the general education of the Chinese peoples in the principles of British constitutional government”. He stayed in the city for many years. In 1911 Mrs Wong Song King was detained for two weeks at William Head after a crew member on her cruise from the Orient on the Empress of India contracted smallpox. The ‘official’ version of this building says it was designed in 1913 by W H Chow for Wong Soon King. There is a permit for $3,000 of alterations to the building that year, but Mr. Chow isn’t mentioned; Wong Soon King is owner, architect and builder. There’s another permit a year later; here W H Chow was the architect for a $4,000 office and store at 23 East Pender for C S Shue, who was also the builder. Then in 1915 there was another alteration, designed by Lee Hing for Wong Sim King for $2,000 of changes to a restaurant. That would be the Kong Hong Low restaurant at 23 1/2 East Pender. This is a confusing set of permits: we know Wong Soon King owned the property, and clearly made alterations both in 1913 and 1915. So why would a different owner apparently build the building at almost the same time as these alterations? The permit doesn’t seem big enough to pay for the building either: in 1910 the building to the right, (on a similar scale) 29 East Pender was designed by R J MacDonald for ‘Su, Lee Wo Co’ and cost $19,000. That might be See Lee Wo, who sold general merchandise, although the company operating here in 1910 were Lee On and Co, who sold dry goods, and were also at 45 East Pender. One possible explanation is that the W H Chow permit was for 93 East Pender – W H Chow made some minor amendments to a property owned by C S Shue at that address early in 1914. He also carried out work at 27 East Pender. In 1914 the owners Yuen, Yuen & Co hired W H Chow to carry out $1,000 of repairs. They were tea and rice merchants. If this building was altered in 1913, it probably dates to around that time or a little earlier. In the 1913 street directory number 23 was vacant (so perhaps new?) and W P Joe, a photographer, was based in 23 1/2. In 1912 there seem to be only two storeys, with Lee On & Co at 23 and Yen Sun & Co ‘upstairs’. There’s a picture in the archives of the 2-storey building in 1906. Whether W H Chow actually designed the 1913 replacement we’re unsure: we haven’t found any permit to confirm that. In 1915 the Hong Kong Club were at 23, and in 1917 Ming Wo moved in to sell cookware – a business still there today. Next door 27 East Pender was one of the earliest ‘Chinese’ styled building in Chinatown. Before that most Chinatown buildings could have been anywhere in the city. The Chinese Benevolent Association Building built in 1909 was the first with the upper floors featuring recessed balconies and building-wide glazing facing the street. This was probably the second to feature this style, designed by a western architect to reflect local preferences. Hon Hsing, a Chinese martial arts school, was established here in 1938, perhaps the earliest in Canada. Today there’s a store that reflects the changing face of Chinatown; Bombast is a manufacturer of contemporary furniture. Our photograph dates from 1981, from a collection we have recently been given access to. We look forward to featuring several more from the same source. The archives description of this picture suggests this is N K Confectionery in 1943. The street directory for that year says in 1943 it was the Westlock Grocery run by Gilbert Mascott who lived upstairs with his wife, Dorothy and Doris Mascott, a student (so probably their daughter). The building sits on the north west corner of Howe and Helmcken. We’re reasonably certain that the image dates to around, or before 1941. The last year that this address was identified as N K Grocers was in 1941, when the store was run by Morito Haramoto, who lived upstairs with his wife Tsuyuko. If the picture dates from when he ran the business, that may be him in the picture. He ran the store from at least 1938, but the grocery was called N K Grocery before this, and in 1935 was operated by Y Fukui. The family fortunes of the Haramotos must have changed dramatically at the end of 1941. From early in 1942 all Japanese Canadian were sent to internment camps, a situation that lasted until some time after the war (unless they agreed to be returned to Japan). We haven’t managed to discover what happened to the family, but we think the Haramoto family must have been sent to Slocan (the same camp that David Suzuki’s family were sent to and where Joy Kogawa’s novel Obasan is set) as Tsuyuko Haramoto died there, aged 29, in 1943. We haven’t identified an architect for the older building. It appears to have been completed on a vacant site in 1927 when a grocery was opened by Winifred E Waters. There had been a house on the same corner some years earlier. Today its a coffee shop underneath the Imperial Tower designed by Buttjes Architects and completed in 1994. This image was taken just over 30 years ago, but there have been some big changes on the block over the years since 1981. The concrete monolith of a hotel is still at the end of the block. The Chateau Granville was only four years old in the original picture, designed by Hamilton Doyle Architects. Next door the 3-storey rooming house at 1134 Granville has been here since 1910. According to the permit it was built by J Hoffmeister for J Clomes (who claimed to design it) at a cost of $18,000. Actually it was John Clowes, who was living in Richmond in 1911, but in Vancouver in 1901. He was listed in the 1911 census as a carpenter, born in Quebec in 1849. He had lived at the address where the building was constructed from as far back as the early 1890s, in the city from the late 1880s, and was probably the John Clowes who died in Burnaby in 1922. In 1981 there was a vacant site to the south of the Clowes Building, and it stayed that way for nearly 30 years. There had been buildings there, including a four storey $21,000 building designed by Townsend & Townsend in 1912, but by 1981 they had been cleared away. In 2013 ‘The Standard’ was completed here, the first market rental building completed under the City of Vancouver’s rental incentive program. To the south is a 3-storey building – we haven’t been able to identify either a date or an architect, although it wasn’t there in 1920, when it was a 2-storey building. In 1981 (and today) it’s part of the adjacent hotel, in 1981 the Blackstone, today the Howard Johnson Downtown. When it was built it was the Hotel Martinique, (and in the 1980s the Hotel California) and it cost Charles Fee $100,000 to build. He probably wasn’t overcharged for the plans; his brother Thomas was half of the Parr and Fee partnership who designed it in 1911. On the corner of Davie was a classic-with-a-touch-of-art-deco Bank of Nova Scotia, designed by Sharp & Thompson in 1930. It was finally considered an unwanted branch 70 years later, and in 2001 Architectura’s design for The Dance Centre (with input from Arthur Erickson) saw the Granville façade retained on the contemporary concrete and glass box on Davie. It’s just possible that this is one of the buildings that Thomas Fee designed and built for himself. In 1915 he certainly owned it, and submitted a permit for $75 of repairs he had designed. Often the design of the windows in Parr and Fee buildings shows the same unusual central pivot on the main pane – there’s an example on the building to the north (on the left of the picture). However, this isn’t a definitive design feature – the Fee Block in the 500 block of Granville that Thomas designed for himself in 1902 had sash windows. The bay windows aren’t common on Parr and Fee buildings, but we’ve seen them use them on other buildings like the Alexandra Hotel. With no permit we can’t be certain one way or another. The building probably got built around 1906; it wasn’t there in 1903 (the block was almost completely empty then), but had been completed by 1912. Galloway-Dorbils Books occupied the first store. The 1920 edition of the Ubyssey had an advertisement for “Edwin J. Galloway, The Old Book Shop, established 1890. High School and University Books, a specialty. New and Second-Hand Books of every description carried in stock, or procured at short notice. Libraries or single books purchased for cash at a fair valuation,” By 1943 when this Vancouver Public Library image was taken the name was slightly changed; Mr. Galloway died in 1931 but the business continued as Galloway – Dorbils. The first storeowner here was Charles W Hills who sold ladies millinery. Charles was born in Toronto, but he arrived in Vancouver via Victoria with his wife, Jane, and young son, William. He moved to California around 1911, but Jane stayed in Vancouver and ran the business for a few more years. By 1943 the hats could be obtained from the Aristocrat Cleaners, but the first store here was occupied by one of Vancouver’s finest photographers, Philip Timms. 0378\ncouver Public Library picture of his store shows the edge of the Hills window as well as the store on the other side, Kyle and Sons Goodcheer Market, a butcher and grocer. 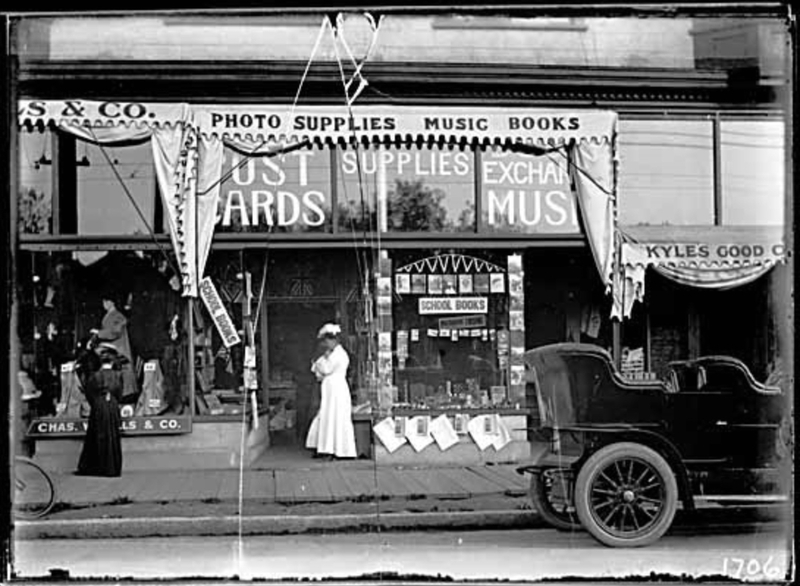 Timms didn’t purely concentrate on photography; his store sold books, sheet music, and photographic supplies. He didn’t last very long here – by 1901 he had already moved and it looks as if the Hills store took the opportunity to expand. In 1908 there were four suites upstairs: Mr Hills lived literally ‘over the shop’, next door was Daniel Kirkpatrick and the third was occupied by Charles W Armstrong and Hugh M Dunn in the remaining unit. In the 1943 picture the Elite Café were tenants; the Museum of Vancouver have the cafe’s A La Carte Menu from 1948. We’re not sure how long this building lasted. The next image we’ve found for the building is from 1981. There’s a store on this site, but not this store; it’s only a single storey building. By the late 1990s the site was vacant, and it was only in 2012 that a replacement was built, an office and retail building designed by Studio One Architects for Bonnis Properties. We mentioned the Jantzen swimwear factory in a recent post about their earlier premises. Built for the Universal Knitting Co, whose machines knitted Jantzen swimming costumes for the Canadian market under licence from the parent company, it was built in 1928. We haven’t been able to identify the architect, and while Jantzen’s Portland factory was designed by Richard Sunderleaf, we’re pretty certain that he didn’t design this one (as the company was under local ownership, and there’s a comprehensive record of everything he did design). We also don’t know when this Vancouver Public Library image was taken (because they don’t know either), but the lack of trees suggests it was probably fairly early in the life of the building. Jantzen continued to produce garments here until the 1990s. After that it became a warehouse for bathrooms and architectural hardware, and more recently a series of ‘pop-up’ uses while the new owner negotiated for a significant redevelopment that will see a residential tower and new retail space on the site. Depending on what time of day you’re reading this (or how long since it was posted) the ‘today’ version of the picture is changing as the 1990s buildings are being demolished. As they’re in the ‘private lands’ of South East False Creek, we can safely predict that there will be a mid-rise condo tower proposed here, although there are no details as we write this. The ‘meanwhile’ auto businesses that were here were in building built in 1993 and possibly designed by Allan Diamond & Associates. Before that the site was home to a big – really big – wooden shed; the Vancouver home to Martin and Stewart, hide and skin merchants. The company – still in business today in Montreal – operated in Vancouver for many years. The Heritage Vancouver newsletter in commenting on the demolition in 1991 noted “An interesting wooden edifice atop stone foundations, the Martin & Stewart Building has been used for generations for the storage and processing of furs and hides; this sharply limited its potential adaptive re-use because of the aromatic nature of that enterprise.” There was an agreement made with the workers union in 1954, a couple of years after the firm established a base in Vancouver, and as late as 1990 the company were the main brokers for BC sheep hides (paying $2 a hide to the farmer). This image was taken in 1977. It looks as if Martin and Stewart expanded their Vancouver operation in the early 1950s by buying out the company already operating in this building, Bissinger & Co (although sometimes wrongly recorded as Bessinger). They had operated in the city for decades, at this location (although until 1926 the street was known as Dufferin rather than W 2nd). We can find them on Granville in 1912 and on Dufferin in 1914, although a little further east, at Yukon St, and by 1916 they were operating at this location. This wasn’t a tannery, so the site isn’t toxic. it was used for the sorting, grading, salting and storage of hides. This 1917 Vancouver Public Library image shows a five year old building. It faces West Pender Street, with the narrow face of the building on Shanghai Alley (shown as Shanghai Street on the 1912 insurance map). It was designed by J G Price for Lun Yick Co, a Chinese-owned company controlled by Yip Chun Tien (more often called Yip Sang, who also ran the Wing Sang Company). Price also designed the West Hotel for the same client in the same year, and the two buildings looked very similar. As it was built in 1912 it wasn’t, as you might expect, the first building on the site. Wing Sang had built a 2-storey building here earlier – we think it was in 1903, designed by ‘Mr. O’Keefe’. Michael O’Keefe wasn’t really an architect, he was mostly a builder, but he was willing to design buildings for Chinese owners to build themselves. He didn’t even live in Vancouver; the only likely M O’Keefe we’ve found was a carpenter, and later a builder, living in Victoria. We know he took the steamer to cross to Vancouver in the early 1900s. The tunnel in the centre of the building (the only real Chinatown tunnel!) led to an alley – Canton Alley – although the 1912 insurance map called it Canton Street. A series of buildings were built here by Wing Sang over nearly 10 years, costing over $150,000 with this $55,000 investment. The seven storey apartment building didn’t last all that long. It was demolished in 1948, and the site stayed undeveloped for many years. In 1998 the CBA Manor and an adjacent building were built. As far as we can tell they were designed by Joe Wai and Davidson Yuen Simpson. There is a 4-storey social services centre run by SUCCESS, and a commercial and residential building on seven floors.